Do you have dust allergies? Dust is one of the most common causes of allergies in households across the world. It comes in many forms and finds its way into everything. Many people try to reduce dust with constant cleaning. But, that can stir up more dust and release it into the air. Fortunately, dust is one of the easiest pollutants for air purifiers to eliminate. You clearly need to find the best air purifier for dust removal. We use this purifier in our home. It works great to move from room to room when we vacuum, dust ceiling fans, and clean light fixtures. It’s pretty light, has a huge True HEPA filter, and its pretty affordable. We have some other recommendations below, but if you’re trying to reduce dust… this is a pretty solid choice. Rather than search around the web for hours; we put pulled together some of our favorite purifiers and evaluated them for dust removal. You can check out the full list below. It includes some value choices like the Honeywell 50250-s as well as some higher end units. But before you continue we thought we’d share an excellent example of what qualifies as the “best air purifier for dust removal.” It AirMega’s 400S model. It’s fairly new to the market and we suspect it has features that other purifiers will in the future. So what’s so great about the AirMega? First and foremost, it’s coverage is a whopping 1,560 square feet. That means it can move a lot of air every hour in almost any room. Moving air is essential when it comes to removing dust. Every minute the 400S fan can move up to 410 cubic feet of air. Second, it has a large… fairly long lasting HEPA filter. Actually there are two, drawing air in from both the left and right side of the machine. Under normal conditions those filters should last at least 12 months. However, what’s really important is that each filter is protected by a prefilter that traps larger dust particles before they get to the HEPA filters. The purifier even tells you when the pre filters need a cleaning. When they do pop off the side cover and vacuum the visible dust from the filter’s surface. If that’s not good good enough you can even wash the filters with a bit of water. Third, this purifier is smart. It constantly monitors how much dust is floating around and a runs only when needed. For example when you’re on vacation and most of the dust has settled it will barely run if at all. But, as soon as you and the kids come in the door and stir things up… the AirMega springs back into action with zero input from you. There’s even an app for iOS and Android to keep tabs on this purifier from afar. Even Amazon’s Alexa plays well with the AirMega. Finally, it looks great. It’s a larger sized unit which means it’s fairly difficult to hide in a corner. If it were ugly it would stand out like a proverbial sore thumb. There are some more affordable AirMega’s for those with smaller rooms or who don’t care about smart features. And if those are still too expensive… we’ve listed some other great options below. What takes dust out of air? Mostly gravity. Eventually dust will settle onto a surface. And, 9 times out of ten dust will eventually succumb to the awesome power of gravity. Sometimes static electricity will also take dust out of the air and stick it to something like your TV. Either way… once it’s out of the air you either need to dust, vacuum, sweep, or mop to get rid of it. An air purifier is the best way to pull that dust from the air before it settles. But, you’ll need to keep the air moving so dust doesn’t settle. How do I get rid of dust in my house? You’ll need more than just an air purifier. In fact, the best way to keep your house dust free is to keep dust out of the house in the first place. We’ll cover tips below, but basically you’ll need to remove shoes, bathe pets, and seal gaps. You’ll also need to keep up on chores to keep the dust you and your family create. Do Air Filters Reduce Dust? Yes. But the key word is “reduce.” You’ll never have a 100 percent dust free home. But, a purifier and a furnace filter are key to getting as close as you possibly can. Do Air Purifiers Get Rid of Dust? Technically, no. They trap dust that passes through their filter(s). When they’re full you need to replace the dust-filled filter or if you have a washable filter… you’ll wash of vacuum the dust away. Ultimately, a purifier is just one tool in keeping dust under control. It’s a great tool but don’t expect too much. You’r not going to turn your house into an Intel Clean room for a few hundred dollars. What is the Best Air Purifier or Cleaner for Dust Mites? The best way to keep dust mites at bay is by removing their food source… dust and dander. We wrote a pretty extensive article on these little buggers, if you want to know more be sure to take a look. When most people think of dust they commonly associate it with outdoor sources like dirt and plants. However, the dust that accumulates in our homes comes from a variety of different sources. Believe it or not, we are responsible for the majority of dust particles in our homes. Sources claim that about 70% of household dust stems from human hair and skin flakes. The fact that we are constantly contributing to the dust in our environment makes air purifiers a smart investment. This is even more concerning when we consider the fact that much of this dander. And it will not remain airborne for long. Once it settles into carpet and other fabrics in our homes it is considerably harder to eliminate. Dust mites are another unpleasant source of household dust that we are generally unaware of. These microscopic organisms thrive in warm, humid areas where there is a high concentration of human dander for them to feed off of. The most unpleasant aspect of dust mites is the fact that they leave small droppings in the areas that they inhabit, up to twenty per day. Dust mites are also one of the most common triggers of allergies and asthma symptoms. Molds are the culprits behind the musty smell in the basements of some homes. However, mold can grow anywhere that water is present and will not always give off a scent. Poor housing construction is responsible for a large amount of mold, but it is also commonly found in bathrooms and around the kitchen sink. The bigger problem with mold is that it sheds millions of spores that contaminate the air in your household. These spores are another common cause of allergy symptoms. The problems that stem from pet dander are a little bit different than the problem of human dander. Both consist of hair and small flakes of skin, but pet dander contains a special protein from the animal’s saliva that is the primary cause of the allergic reaction to pets. This protein sticks to pet dander when animals clean themselves and find its way into the air when the dander is released. Fortunately, many manufacturers have designed air purifiers focused on targeting pet dander. Pollens are responsible for dreaded seasonal allergies. These allergies occur when trees and other plants like ragweed release pollen into the air, which finds its way indoors by extension. Runny noses and red eyes are merely signs that your body is trying to get foreign particles out of your system. Air purifiers are a popular defense against pollen because they work hard to filter pollen from the air, so your body doesn’t have to. Unlike air pollutants like odors and gases, dust is much easier to eliminate. Although there are many sources of dust particles most of them have fairly large particle sizes, especially compared to the small particle sizes of odors and gases, which are so small they require an activated carbon filter to remove. Some dust particles are so large that they are visible to the naked eye. The particles that can be seen in a beam of light are usually in the neighborhood of 50 microns or larger. Although human dander is responsible for the majority of indoor air pollution, skin flakes are generally the largest particle pollutants in homes. Mold spores and pollen are also relatively large, ranging from 1 to 100 microns. However, the vast majority of dust particles are much smaller. Most are 3 microns or less but in the scope of all pollutants that is still relatively large. Dust mites and pet dander are some of the smallest dust particles, usually around 0.3 microns. For more information, make sure to read our detailed discussion on reducing dust with air purifiers. There are a few different technologies that exhibit various degrees of success at eliminating dust. However, there is only one that can nearly guarantee satisfaction. HEPA filters are the industry gold standard and for good reason. Dust is relatively simple to eliminate because HEPA filters are very effective at trapping dust particles. In fact, HEPA filters are the only filtration technology standardized by the United States government to be effective at removing 99.97% of airborne particles larger than 0.3 microns. This means that a HEPA filter is almost guaranteed to eliminate all of the dust particles in your home. Nothing else comes close. Although HEPA filters are extremely effective at eliminating dust, they only work when they are coupled with an air purifier capable of cycling a large amount of air through the filter. This guide features machines that will do just that. The Blueair 503 is a top-of-the-line air purifier. Blueair prides itself on elegantly designed machines that feature cutting edge technology. The 503 is a larger model that will be effective in rooms of up to 580 square feet. The 503 is loved by buyers with asthma and is even powerful enough to be effective in extremely dusty climates. 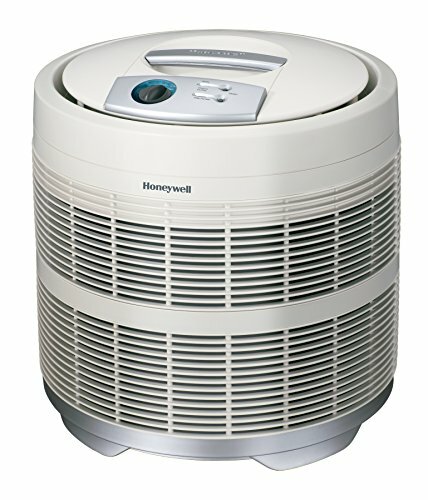 The round air purifier is Honeywell’s most powerful machine. It is not the flashiest air purifier but it is extremely effective at eliminating dust from the air. The round air purifier is a larger machine that is able to purify rooms of almost 400 square feet and its round design allows for 360-degree airflow. Users have also noticed drastic dust reduction in their homes from using this machine. The GermGuardian is one of the best-selling air purifiers on the market today. It features a slick tower design, which allows it to fit in a variety of different places in your home. It is simple to use, and users have noted that the lack of dust in rooms where a GermGuardian machine was present. Read the detailed GermGuardian AC4825 air purifier review here. Given that all of these machines are effective at removing dust it is fairly easy to choose the right machine. The Honeywell Round Air Purifier is the best value machine, and with its low price, it is perfect for buyers looking to try an air purifier for the first time. However, the Blueair 503 is a more effective multi-purpose machine and can be great for eliminating odors as well as dust. We hope this guide to choosing the best air purifier for dust removal helped you find the best machine for your needs.